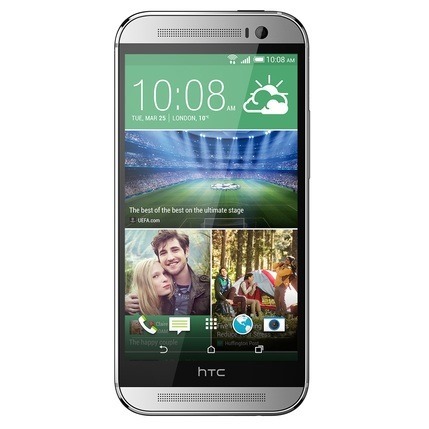 Rather impressively, the HTC One M8 is now available online in the US from AT&T, Sprint, and Verizon Wireless. Pricing doesn't deviate too much among them, but there is enough variance to make it worth shopping around for anyone who isn't already tied down. Verizon is making the best offer here. Price wise, the carrier will let go of the M8 for $199.99 with a two-year agreement, $25.22 a month with Verizon Edge, and $599.99 without a contract (which, by the way, is $100 less than the Google Play Edition and the lowest contract-free price of the three carriers). What makes the carrier more compelling is its buy-one-get-one-free deal, which applies to people activating a new line of service. Of course, Verizon's high service costs will eat up all of your savings, but that's a moot point if you're already wedded to the carrier. AT&T's two-year agreement comes with the same $199.99 upfront fee, but its no annual contract price is a bit costlier at $639.99. AT&T Next 12 calls for twenty monthly $32 payments, while AT&T Next 18 requests twenty-six servings of $24.62 instead. Sprint's raising the price even higher, though you potentially save more in the long run due to its lower monthly bills. A two-year agreement goes for $199.99, whereas a contract-free device costs $649.99. Alternatively, you can pay $27.09 for twenty-four months. Best Buy's ready to sell you its exclusive Amber Gold version or the other available colors across these same three carriers. 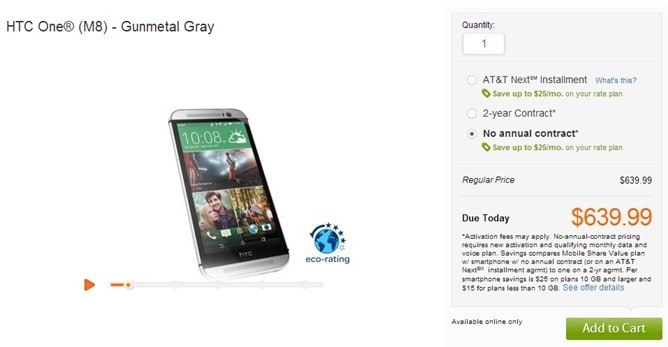 T-Mobile doesn't plan to offer the phone until next month. Update: T-Mobile has since provided more specific pricing and availability information. 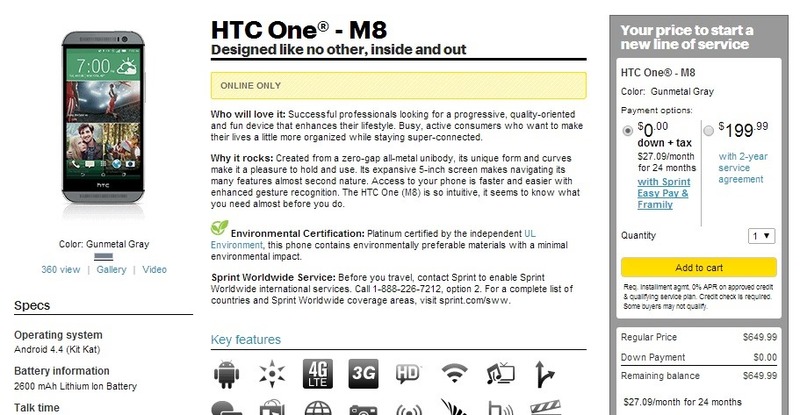 Its HTC One M8 will launch online and in stores on April 11th (also known as Galaxy S5 day). 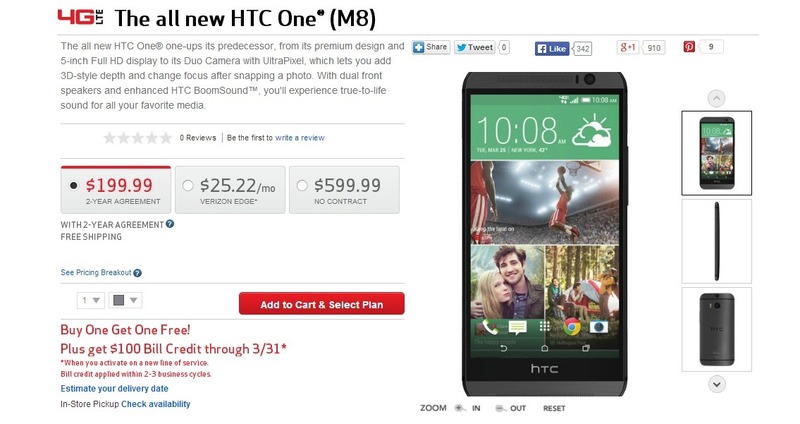 The phone will cost buyers $26.50 per month for 24 months, reaching a total of $636. Links for the other carriers are available below.